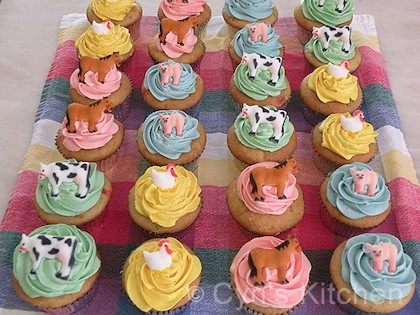 Old MacDonald had a farm… E I E I O and on his farm he had some… CUPCAKES! E I E I O! Old MacDonald Had A Farm is an American Classic and has been sung by countless generations of children. What makes it such a beloved song is its familiarity and its catchy tune while it teaches children to recognize different animals and the sounds they make. Best of all, it is a FUN way to learn. One way to make this classic even more fun is to make a party for your little ones using Old MacDonald as the theme. Little ones do not have long attention spans so it is best to keep this party very short and simple; the party should be no longer than one hour. Ask a few friends to help you with the party, little ones are active and twelve of them… well you get the picture. Speaking of pictures, you do not want to miss a picture perfect moment. Have one of you friends standing by ready with the camera to capture some adorable moments at the party! And of course, the lyrics to Old MacDonald Had A Farm! Prepare the cupcakes according to the directions on the mix. Bake and cool cupcakes. While the cupcakes are baking and cooling, divide the frosting into four small bowls. Add a few drops of liquid food coloring to each bowl to get the shades that you want to use to decorate your cupcakes. Note: The red will never be a true red with the supermarket variety of liquid food color, it will be more of a dark pink. Next, put the star tip into the pastry bag and add the contents of one bowl to the bag. Pipe the frosting on top of each cupcake starting at the outer edge and moving inwards in a quick circular motion and then top each cupcake with a sugar animal. Repeat this for each color. Wash the pastry bag after using each color and dry the pastry bag well so that the colors do not run together. For those of you not experienced in using a pastry bag to frost your cupcakes, do not despair, you can simply frost the cupcakes with a knife or an offset spatula then add your decoration and presto, you have your finished cupcakes. Set the table with a cup, plate and napkin for each child. Place the cupcakes on platters and use as the centerpiece. You are ready for the party! When each child arrives give each child a box of crayons labeled with their name to color one of the Farm Animal Coloring Pages.This will keep them busy until all of the guests arrive. Now, it is time to get ready to sing. Start by asking the children to choose their favorite farm animals and review the sounds that they make, then sing Old MacDonald Had A Farm! Next it is time to serve the cupcakes! You can review the sounds that each animal makes when you serve the cupcakes along with a cup of milk for each child. Serve the children first and then offer the parents or caregivers a cupcake to enjoy too. Each child goes home with a box of crayons and Farm Animal Coloring Book favors. Let me know what you think of this party idea and send in pictures of your Old MacDonald Had A Farm Cupcakes!